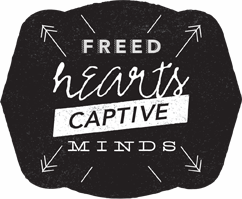 At the Vintage 21 Women’s Conference, “Freed Hearts, Captive Minds”, I chose to attend the breakout session, “Breaking Free from Guilt and Shame”, led by Natalie Holm. This session was designed to show differences between guilt and shame, show us the role the two play in our Christian lives, and teach us more about repentance. In a nutshell, Natalie started the session by saying “Guilt is about what you’ve done, shame is about who you are.” Up until this point, I had never taken the time to dissect the two in my life. Although I often feel guilt whenever I don’t live up to the call of God, I have rarely felt a sense of shame of who I am. The following quote included in Natalie’s study guide caused me to stop and consider if this could be because I have a less-than-biblical view of sin. The very good news from this session is the reminder that my guilt (and even my new-found shame) do not define my identity in Christ. Instead of looking at my guilt and shame as baggage, I should look at them as opportunities to glorify God. What good news it is to know that our recognition of our shortcomings leads us to a cross of immediate reconciliation and grace. When we see ourselves in light of the Gospel we can see that we’ve all done terrible things (guilt), and are separated from God (shame). The cross makes a way for our sins to be forgiven (no more guilt) and it also enables us to be reconciled to the Father (no more shame). If shame is primarily about who we are, then we must hold tight to our new identity in Christ. Remorse: Typically me-focused. Leads to lots of wallowing. Repentance: Moves you toward God, doesn’t skew the image of who you are. If you know me, I’m a wallower. This session made me realize that I often deal with my sin by believing that if I roll around enough in my guilt and remorse that it will somehow make me right with God. How often we need to look to the glory of the cross to appropriately see our standing with God and come to a right relationship again.